Oct. 17, 2015, Taan Fjord, Icy Bay, Alaska. The friction that held silt to silt and rock to rock began giving way. Those first rocks shoved more rocks, and then more still. Some 200 million metric tons of rock slid down the mountain in a crash that must have been deafening. It hit the ocean, sending up a wave that peaked at nearly 600 feet high. The wall of water stripped alder thickets from the hillside, tossed boulders up hills and carpeted the land in rubble from the bottom of the ocean. The mountain sprang back, released from the weight. Bedrock shuddered from the impact of the slide, and the crash of tsunami-carried boulders echoed through the earth. All these clues were picked up by seismometers and decoded by Colin Stark, Goran Ekstrom and their team of distant scientists. Two months later, they brought the data to a conference. Word spread. Geologists from around the globe began to plan an expedition to a place so remote that not a single person saw the wave. Call those geologists the ambulance chasers of Earth. The processes that shape our planet are often disastrous. Ice sheets crushing forests. Valleys blanketed in ash. Eruptions, tsunamis, meteorites, landslides, floods and earthquakes. Geologists thrill to these disasters. They rush to the scene, often millions of years too late, reconstructing the crime from a few clues — sand grains, ash layers, fossil fragments — that time has left behind. 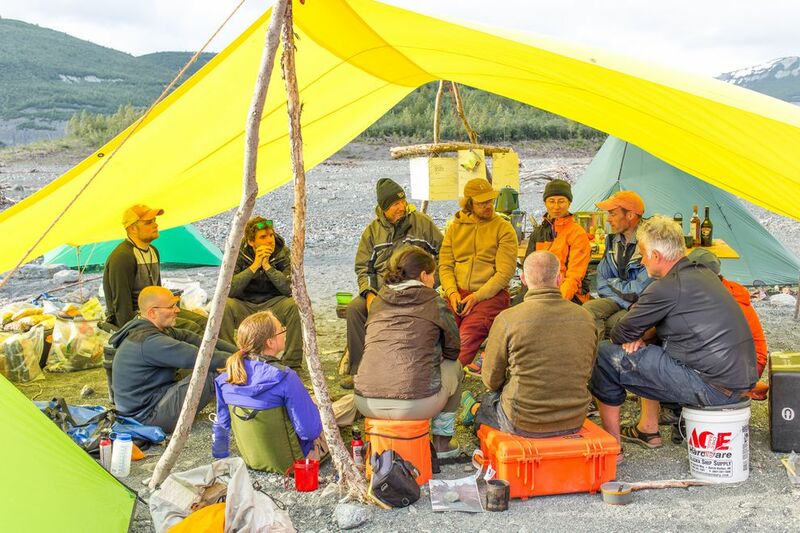 Geologists swarmed to Taan Fjord in three separate expeditions that added up to nearly 30 different people in the field. The nearest base of logistical operations was Yakuat, where the scientists chartered a boat to take them across 60 miles of open ocean to where they built a miniature tent city with stoves and shovels and maps and iPads, plopped on a stretch of sand left behind by the tsunami. On the satellite photos, the camp is just a few circles and rectangles of color amid a swath of gray devastation. "I woke up every morning and I just couldn't believe the impact," said Marten Geertsema, one of the landslide specialists. "If we'd been there (at the campsite) in October, there would have been a 200-foot wall of water rushing over us." A cluster of people stood on a rubble pile, heaving cobbles and small boulders out of a hole. It took two days to claw out a grave-sized trough, its walls displaying tsunami-tossed layers of sand, boulders and shattered wood. This was only one of many holes. My husband Hig, a tsunami specialist, prides himself on his prowess with a shovel, while I joke that he is a Ph.D. ditch-digger. Other geologists fanned out across the fjord to stare at other types of rocks. Anja Dufresne has studied landslides around the world, and she laughed when I asked her about the equipment she uses. "Just a rock hammer and our eyes. Mostly walking. We did a lot of hiking, back and forth over the whole landslide, taking a few samples, but mostly looking," she said. She climbed strange hummocks left at the bottom of the slope, and studied whether the layers had tilted or crumbled as they fell, hoping to figure out just how a mountain slides into a bay. 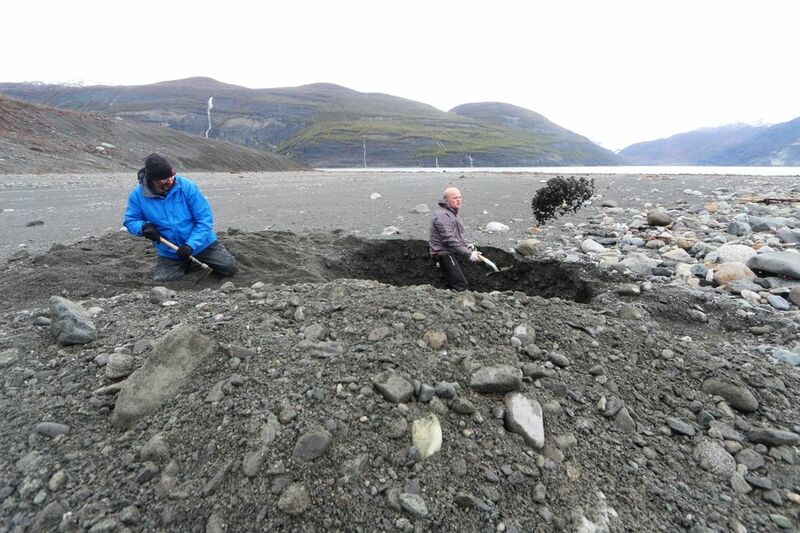 Three scientists set up a tarp-roofed "office" at the head of the fjord. One held a joystick like an old-school video game controller, manning a remote-controlled boat to map the bottom of the ocean. One of his partners watched the boat, providing directions, while the other watched bathymetry data scroll across the screen, also giving directions. Another team traced the shores to map the reach of the wave. Near the water, the landscape was barren, piled with meters-thick layers of torn-up rock and gravel or scoured to bare bedrock. The uppermost edge of the wave leaves more subtle clues. Dead leaves wrapped around an alder trunk. A water line of sticks. You reach these clues by traversing muddy alder slopes, perched precariously above the cliffs, carrying a 6-foot-long pole adorned with a several-thousand-dollar GPS antenna the size of a dinner plate. It's reminiscent, perhaps, of bushwhacking with skis. Patrick Lynett has surveyed the aftermath of tsunamis all over the world. "Taan Fjord," he said, "was the largest. Hollywood huge. It was hard to anticipate how difficult it would be to survey. I was in Japan, surveying 10-meter-plus run-up all along that coast. The highest wave we saw there was 40 meters. In Taan Fjord, it was higher than that along the whole shoreline. 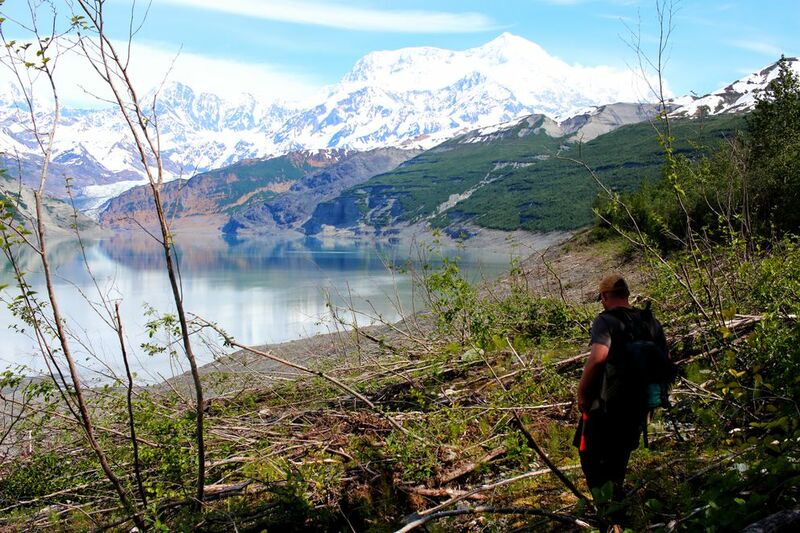 So if you have 80 meters of run-up on a 30-degree slope with a 4-meter pile of torn-up trees and brush in the way — it almost takes a professional mountain climber or a wilderness expert to survey it. Luckily we had people like that along." "Most landslides I've studied you can drive to by car. Or, at least drive to the trail where you can walk to it," Dufresne explained. "Here, we couldn't just drive back for another sample if we forgot to take one. Here, we had to rely on each other." Sometimes they would climb into two-person packrafts, ferrying each other miles back and forth between camp and their field sites. Most of the scientists hadn't met each other before they squeezed their tents inside the same tiny bear fence, used the same beach for an outhouse and filled their water bottles from a tarp-lined pool of melting icebergs. In the evenings, they discussed and debated the tsunami's small mysteries. "Tsunami bullets," where rocks had been embedded in bark-stripped trees. "Birds nests," where rock-covered icebergs had melted, leaving a perfect circle of schist behind. When scientific papers are written up, the "methods" section usually reads as the driest and dullest part. No one writes up the hypothermic efforts to rescue a skiff sunken on the beach. Or a scientist blinded by pepper spray. Or the day that the scheduled plane broke down, leaving everyone frantically clearing a runway wide enough for the larger Otter (the only plane available) to turn around — heaving and rolling the smaller boulders, while burying and smashing the larger ones. Why go to such trouble, on the edge of an obscure and unoccupied fjord? Hig's eyes sparkled when I asked him this question, quickly sketching a flurry of diagrams on a small whiteboard. All that digging and trudging and measuring tells the sedimentologists how a tsunami leaves a distinctive fingerprint of layers behind. It tells the computer modelers how to calculate the height and period (the time between two waves) of a tsunami, and the landslide scientists how to piece together complex motion in giant slides. 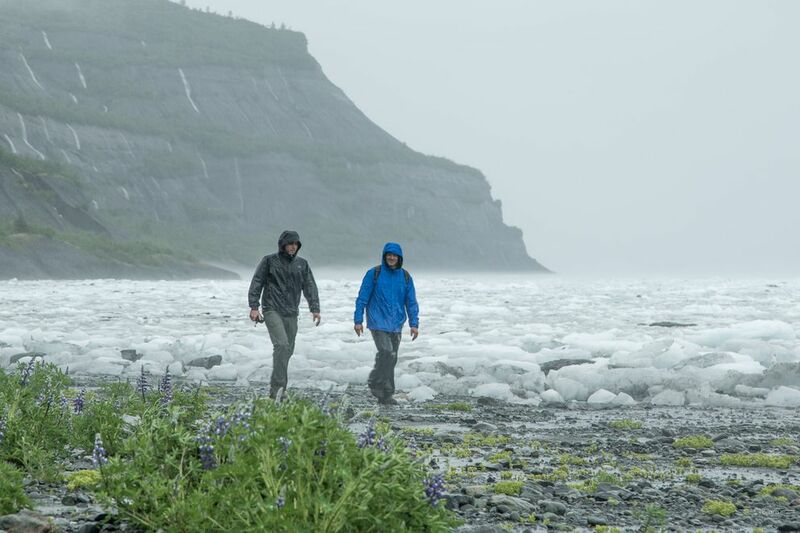 The glaciologists look at how these extreme events stack up with the day-to-day drama of glacial retreat. It helps them all uncover the remains of ancient disasters — and the potential for new ones. It tells all of us what we should be worried about. My husband and I watched "The Wave" together. It's a Norwegian film dramatizing a version of the same disaster. A fjord, a landslide and a 240-foot-tall tsunami sweeping over a tourist town. He paused the action every so often — the screen frozen on a wall of rushing water — to explain where they'd got it wrong. "This really understates the power of a wave like that," he said. "It might look more like the shockwave of an atomic blast. The wave would turn from white foam to black as it ran on shore — not just water, but a wall of churning rocks with boulders flying out of the front of it. 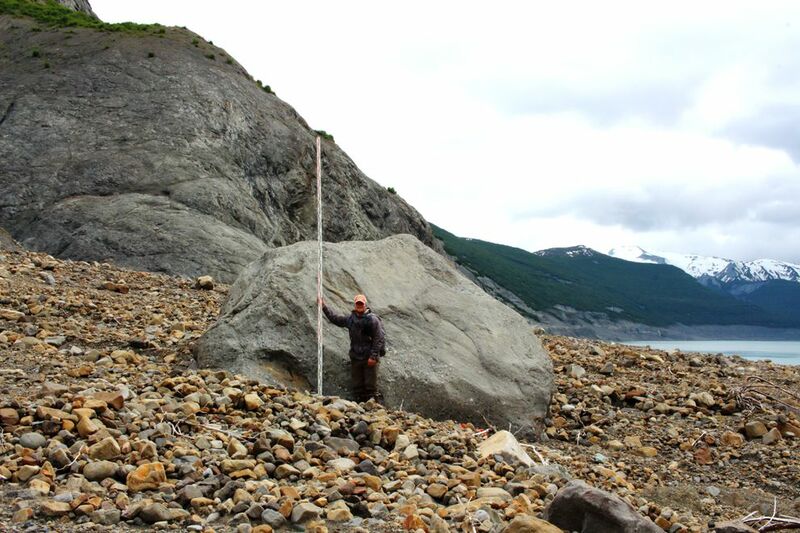 In Taan Fjord, we found head-sized rocks tossed farther than the wave even reached. None of those buildings would be standing." In Norway, the slide and tsunami depicted in the movie will happen, someday. Alaska mountains are unraveling much more quickly. The Taan Fjord landslide was the largest in North America since Mount St. Helens erupted and collapsed in 1980, but it is not unique. 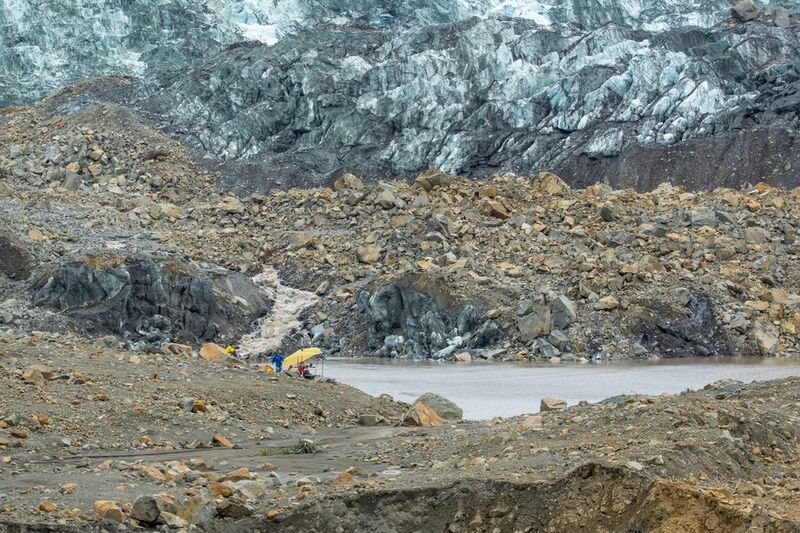 *In 2012, one side of Lituya Mountain crashed down, sending a landslide 9 kilometers across a glacier. *In 2014, it was Mount La Perouse, shedding 68 million metric tons of rock on top of another glacier. *Last Oct. 11, a few days before the Taan Fjord slide, 45 million metric tons of rock let loose from Canada's Mount Steele. *This summer, on June 28, 130 million tons of an unnamed mountain landed on Lamplugh Glacier. 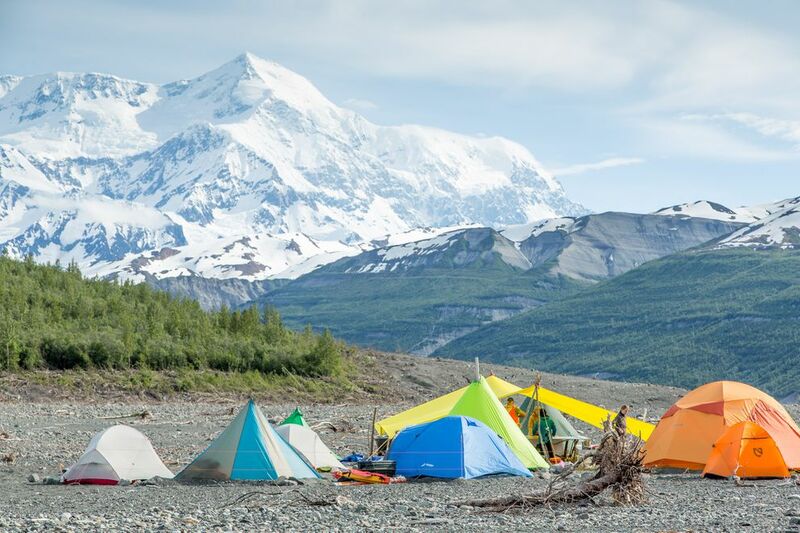 If you plot them on a map, you quickly see that all five of these crumbling mountains lie within a couple hundred miles of each other, in the steep and icy St. Elias Range that straddles the Canada-Alaska border at the northern edge of Southeast Alaska, and surrounds Glacier Bay. Glaciers carve out fjords, and glaciers hold them up. Steep valley walls are propped up by the ice that fills the space between them. When glaciers melt, the mountains are "debutressed" and prone to collapse. 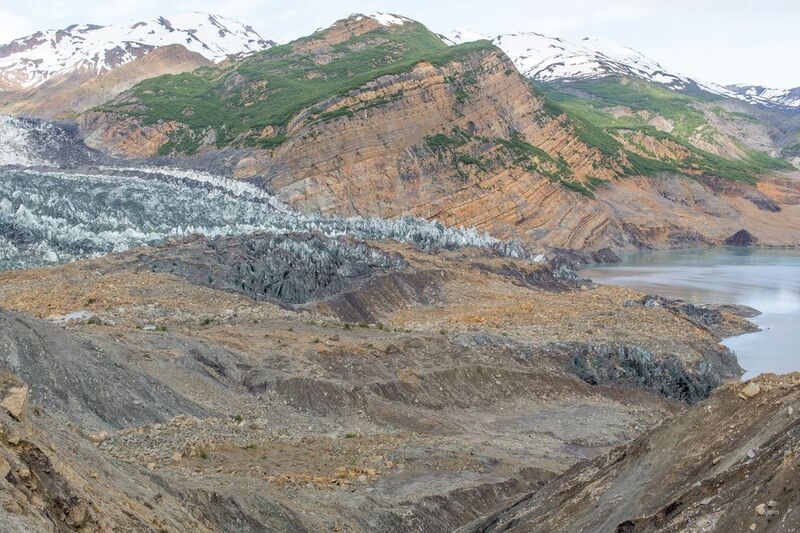 More than 95 percent of Alaska's glaciers are retreating, many of them at an astonishing rate, leaving these unstable slopes behind. Melting permafrost also causes mountains to come unglued. We should expect more giant landslides. We should expect a few of those slides to fall into an ocean or a lake, creating a tsunami. The most recent slide in Glacier Bay happened in the middle of tourist season, when cruise ships with 2,000 passengers visit frequently. Geertsema and Dufresne surveyed that one too. "It was so loud," Geertsema said. Even after the slide was done, it sounded like a continuous roaring stream coming from the slope above them. Their time-lapse camera showed puffs of dust trailing behind still-moving boulders. They hoped it wouldn't slide more while they were standing there. Unlike earthquakes, landslides don't have a regular "recurrence interval." Where one slide happens, another might follow — immediately, or later. The Taan Fjord slide began 20 years ago, slid a short distance, and stopped — until last October. The Lamplugh slide in Glacier Bay made it 10 kilometers along the glacier but didn't hit the water. The next one might. The Alaska version of that disaster flick would show the atomic blast of ocean sweeping over a tourist-stuffed cruise ship — glacier viewing gone horribly wrong. As the glaciers shrink and tourists flock to the few that still calve into the ocean, that disaster becomes more and more likely. 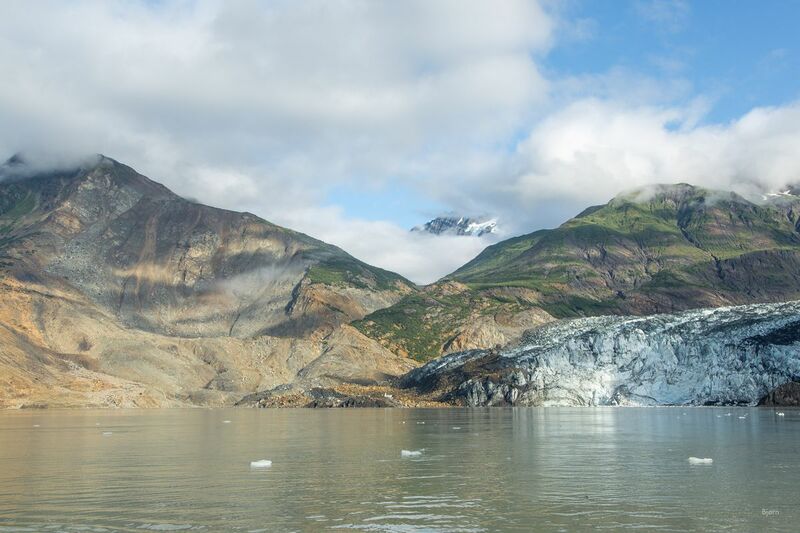 Glacier Bay is the most likely place, but it could happen in Prince William Sound or the Kenai Fjords — even at places like Grewingk Lake in Kachemak Bay, where it already did happen in 1967, long before it became the popular tourist destination it is today. Scientists aren't Hollywood types. When I asked Lynett about a landslide tsunami slamming into a Glacier Bay cruise ship, he paused, not wanting to appear too sensationalist. "I think … No, I'm not even going to go there," he said. "Let's just say that a tsunami like that, with large ships around, would be horrible. With this sort of hazard, you really need a grass-roots effort to get anything done. The only way to have any warning for a landslide tsunami is to have sensors monitoring the stability of the slope. They do that in some places. From what I've seen, the long-term costs of letting disasters like this happen are worse than the costs of trying to prevent them." Geologists I talked to were awestruck by the Taan Fjord disaster. Enthralled. You don't become a hazard geologist if you don't get excited by just how wildly the earth can behave. But most hazard geologists eventually find themselves studying human tragedy. Hig has stories of sampling in villages in Sumatra, where the 2004 tsunami flattened every structure, then scoured the foundations until only pits remained. In some places, 95 percent of the people were killed. You don't become a hazard geologist if you don't have a certain level of optimism that we can learn from those catastrophes. It's not just cruise ships and tourists at risk. Underwater landslides could bring tsunamis onto most of the world's shores. Steep slopes can slide anywhere. Maybe better models of wave dynamics will help steer boats clear of the most dangerous areas. Maybe the scientists will be able to monitor the mountains, and provide hours or days of warning before they fail. They've all returned from the field now. Back at their computers with notebooks and measurements and 3-D photographic renderings of rocks, they're trying to figure it out.